Flight attendants dropped packages containing wellies and Virgin Atlantic swag to influential shop owners, radio stations and other businesses. To promote its new direct flights from Seattle-Tacoma International Airport to London Heathrow Airport beginning in late March, Virgin Atlantic in late January recruited flight attendants to surprise and delight consumers and influencers in the Emerald City to emphasize the natural connections between Seattle and London. The campaign included a recognition program and contest centered on “reignmakers” in the community (a play on the royal “reign” in London and the “rain” in Seattle). The two-day program kicked off with flight attendants zipping around Seattle in branded Mini Coopers featuring the union flag painted on top. 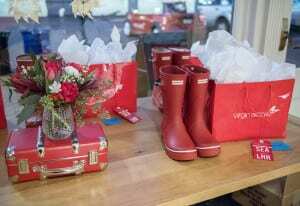 They dropped packages containing wellies and Virgin Atlantic swag to influential shop owners, radio stations and other businesses around the city. 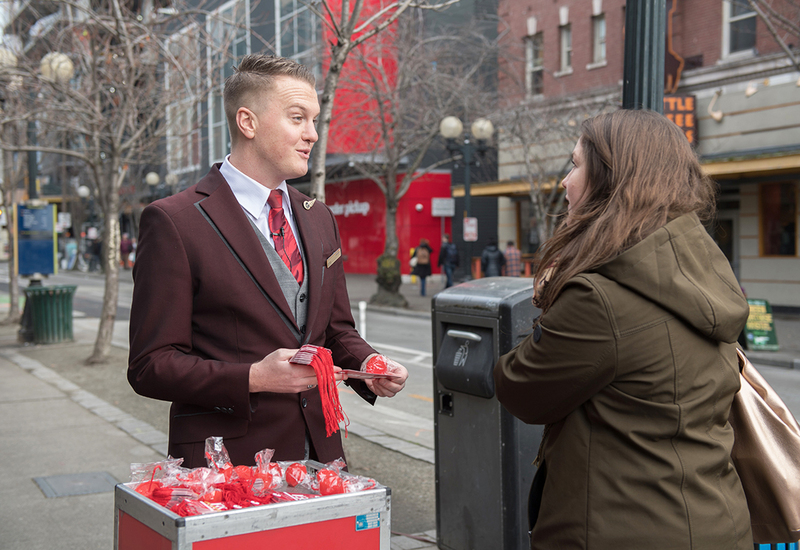 On the second day of the promotion, the flight attendants focused on consumers, visiting high-traffic locations throughout Seattle and pushing the actual drink carts they push on the planes, passing out branded luggage tags and umbrellas. Virgin Atlantic also invited Seattle influencers across travel, lifestyle and food media to a private breakfast at the aptly titled The London Plane restaurant in Seattle, where they received branded gifts in addition to viewing an exclusive message from Sir Richard Branson, founder of Virgin Atlantic. They also qualified for the inaugural flight for onboard blogging and reporting on their experiences. 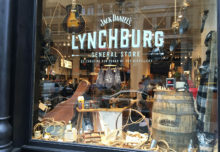 An additional push for the promotion took place on social media, where Virgin Atlantic hosted a Seattle Reignmakers contest. Through Feb. 28, people could nominate folks they say are visionaries and rule breakers. To enter the contest, they uploaded a Seattle-based photo to Twitter or Instagram, and tagged their “reignmaker” and @VirginAtlantic along with #SeattleReignmaker in the post. 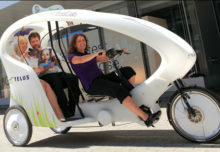 The contest closed on March 3, when two winners were selected for a free trip to London. Agency: Inspira Marketing Group, Norwalk, CT.